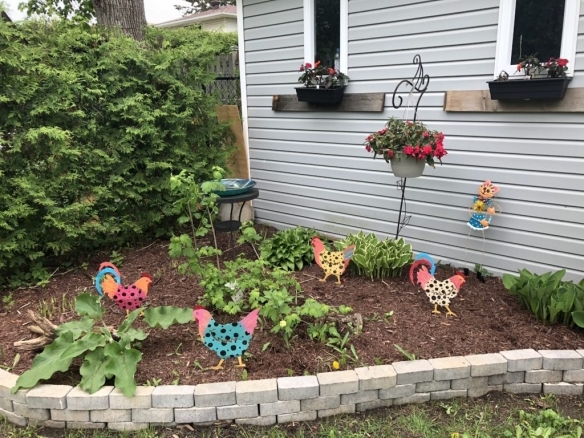 A couple of years ago I bought some metal chickens and roosters at the dollar store to put in a flower bed in my back yard. 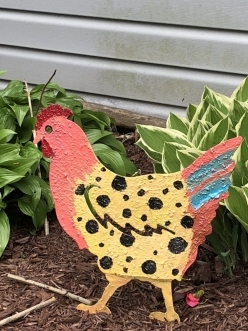 To be clear, I don’t like doo-dads in my garden, but these chickens and roosters were rusty antique-looking critters and I love anything vintage or antique. 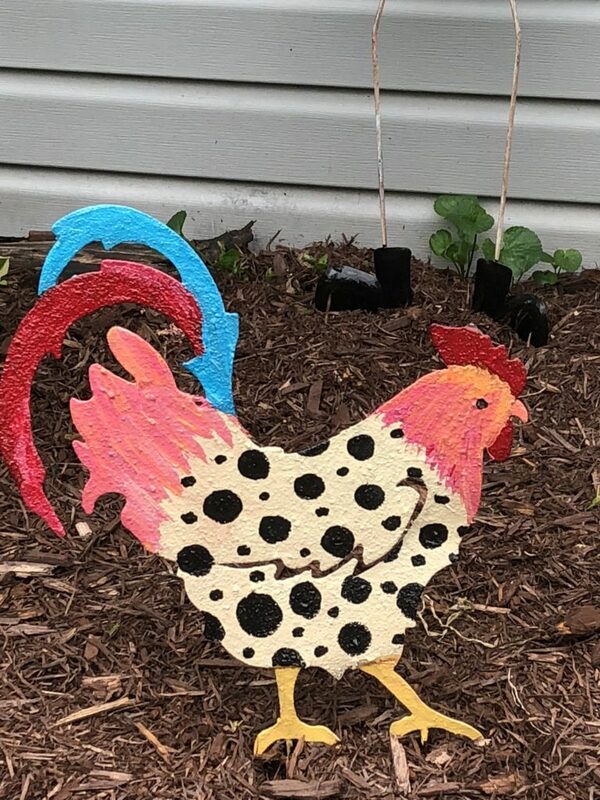 Anyway, this spring, as we were cleaning the garden beds, my husband suggested that I paint the chickens. Yikes, doo-dads in my garden! 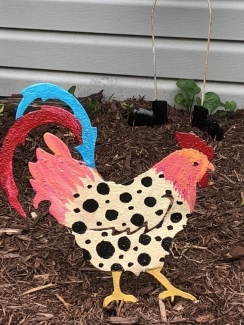 Well, after several nudges from him, I finally decided to paint the darn chickens. Actually, they look kind of cute. Here’s a photo log of my chicken-painting adventures. I had already painted the rooster’s cone and wattle when my husband came in to take some before-and-after photos. Enjoy! 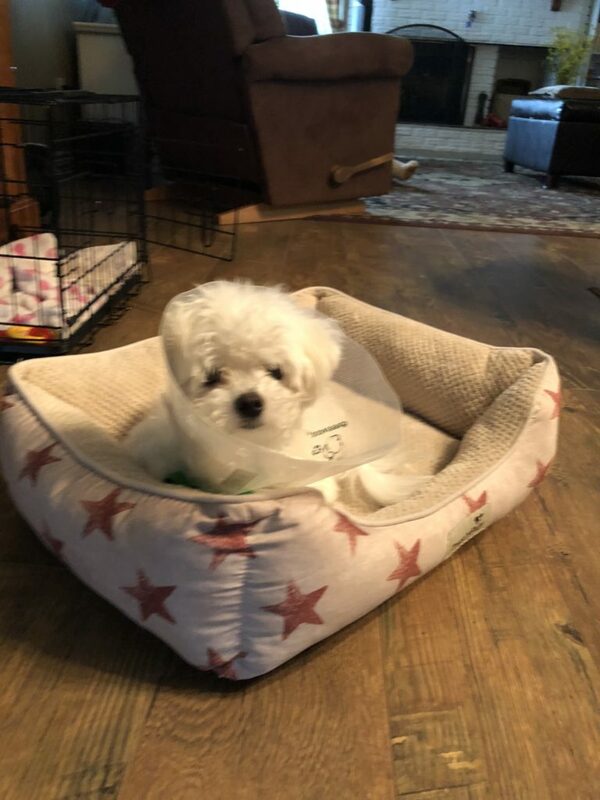 This is Holly, my sweet little Maltese. She’s putting up with the cone, but still happy to be near me while I paint. Here they are, in glorious colour! 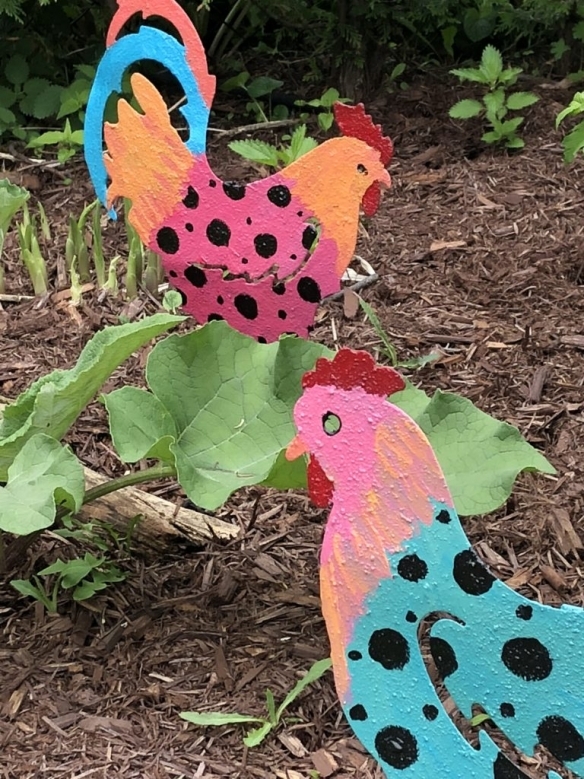 Can’t you almost feel the breeze as it blows through the tall grasses? The flowers bend and sway as if dancing to the sound of the wind. Just wanted to show off a new glass-on-glass mosaic that I made in an all-day workshop, recently. 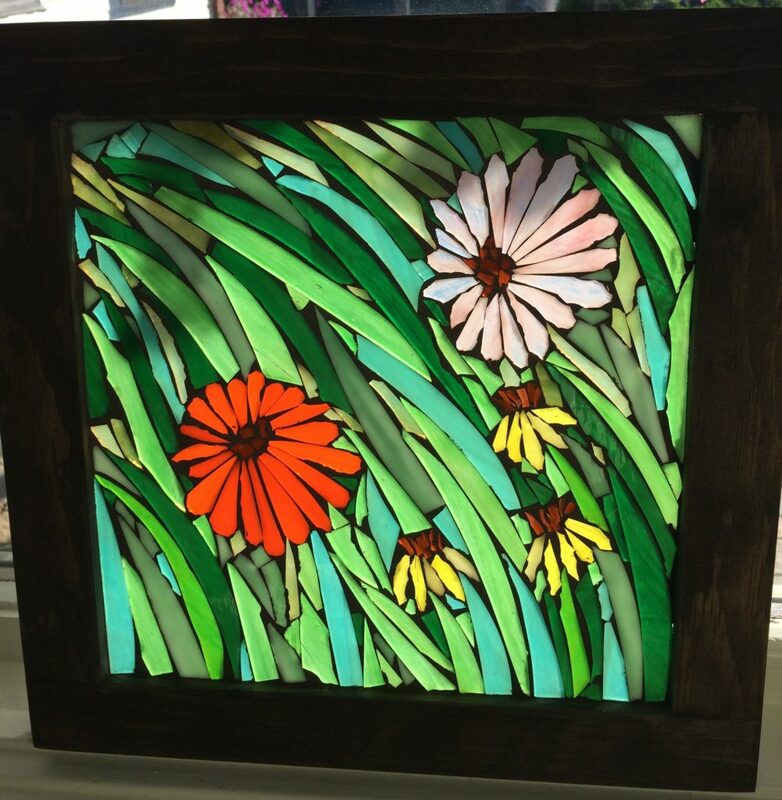 I love the freedom of glass mosaics, you can just create as you go along. On the other hand, I also love the precision of traditional stained glass, where every piece is precisely cut according to a pattern. Oh, life is just all about choices! Happy weekend, everyone. Thanks for stopping by. I hope you will drop in again, soon. 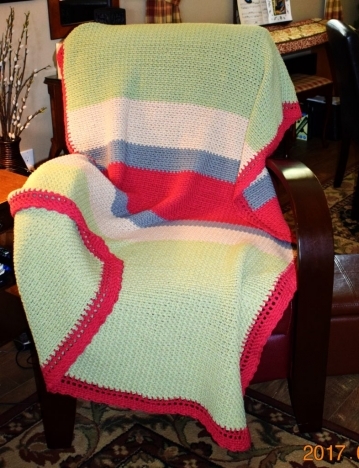 It never even occurred to me that my husband would like a crocheted blanket. So, when he commented on how cozy this one would be when he grabs a quick nap on the sofa, I was thrilled. 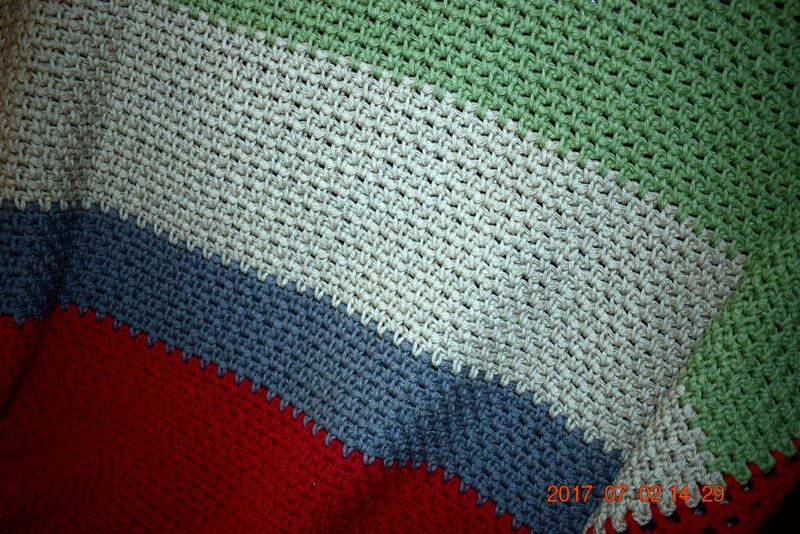 I make all my blankets with Bernat Handicrafter 100% cotton, using a 5.5 mm hook. This one is 140 stitches across and I made it about seven feet long so it would cover my hubby’s 6-foot-tall frame. This is my favourite stitch, called the Woven Stitch, but is also known as the Granite Stitch and the Moss Stitch. 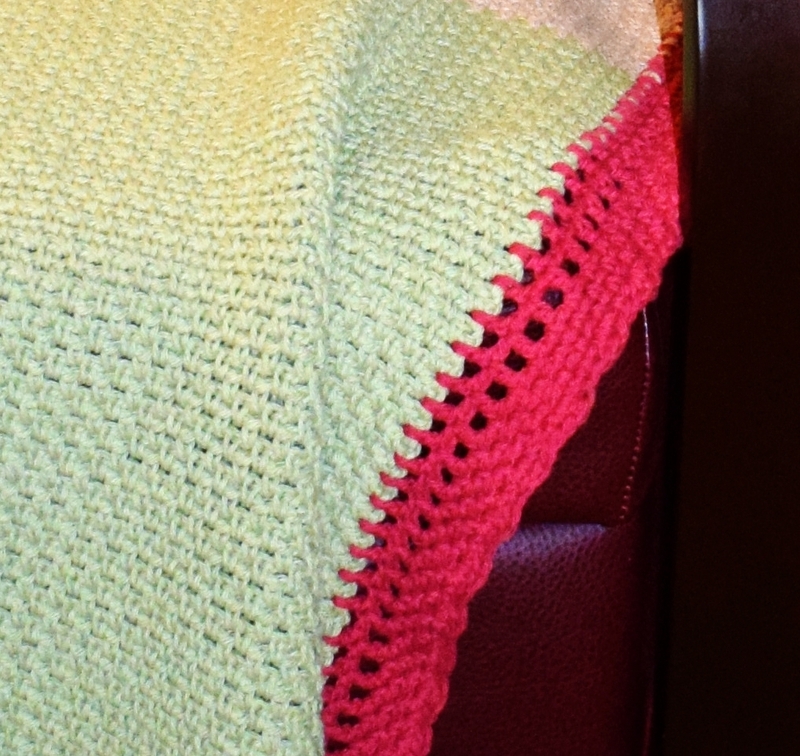 To finish it off, nicely, I crocheted a border that is several rows deep. 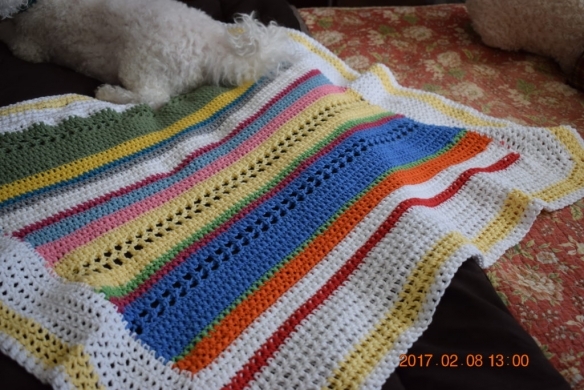 I love working on these blankets–or, afghans–when I’m watching television because it’s so relaxing and doesn’t require any counting or real concentration. 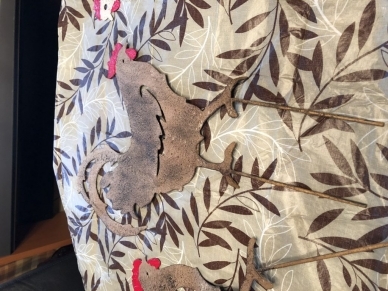 By the way, these Bernat colours I used in this one are Country Red, Sage Green, Jute and Overcast. Here are some close-ups. The border…first two rows: dc, ch1, across. Next three rows, woven stitch. Last row scallops made in your favourite way. That’s it for now. I hope this inspires you to make a cozy blanket for someone special in your life. Thanks for stopping by. I hope you’ll drop in again, soon. I used to think of glass as an unyielding medium. Boy, was I wrong! Glass-on-glass cardinal. I was so excited when I finished it that I wanted to take a photo right away so I could post it. That’s my sweet husband’s thumb on the left, patiently holding my art up to the window while I took the photo. 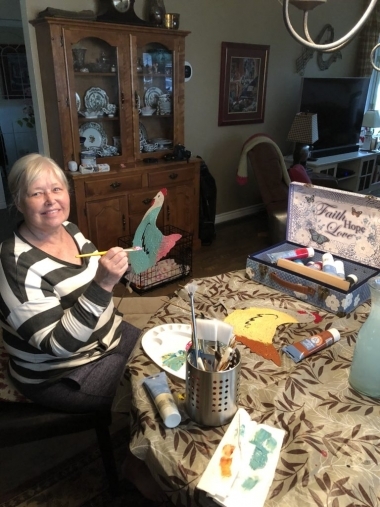 Learning how to make something with stained glass had been on my bucket list for decades. 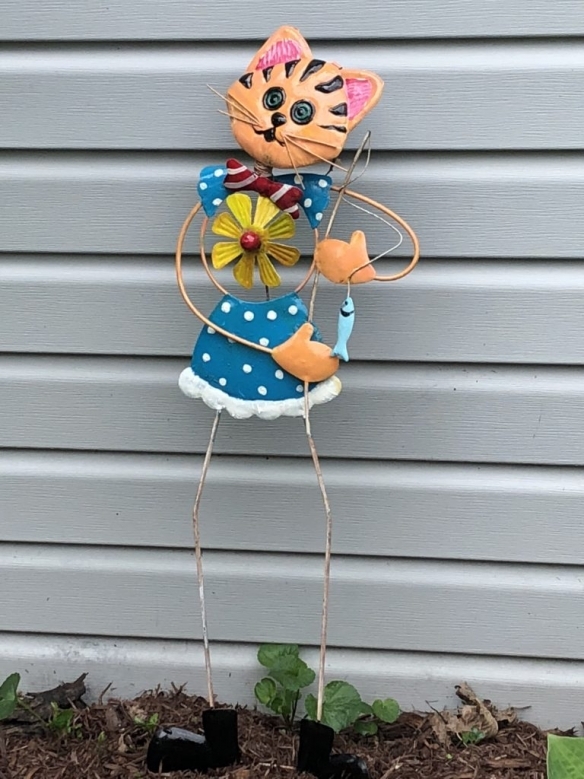 So, I finally took a class on how to make a sun-catcher. While I enjoyed the class, and was very proud of my finished product, I wasn’t convinced that stained glass was my “thing.” That said, I spent hours and hours wandering through Pinterest and found myself captivated and inspired by the photos of stained glass art. Sometimes you have to try something more than once to really get a taste for it, right? Well, three or four stained glass workshops later, I’m hooked! Back to my statement about glass being unyielding: once you learn the basics of cutting glass, you can make it take on any shape you want. 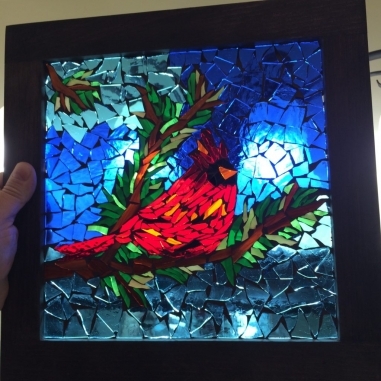 This cardinal, (shown above) which I made today in a workshop led by Cindy Laneville, well-known Ottawa Valley stained glass artist, demonstrates beautifully how glass can be manipulated with a couple of simple hand tools. I hope this inspires you to try something new. Check your bucket list and just go for it! Afghans for tots, number eight.